Heimler and Proc’s work is inspired by German expressionism, cubist perspectives, pop-art and cartoon strips showing a love for detail. Their paintings are flamboyant, colourful and packed with concrete narrative based on literary, biblical and historical concepts. They look to underline human individuality and to show emotions. 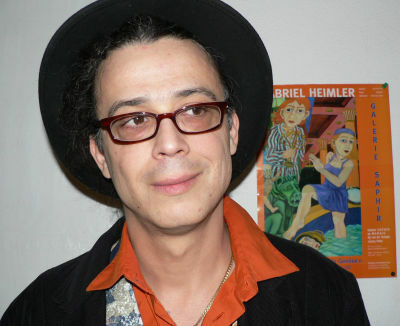 Gabriel Heimler is an artist of international renown who was born in Paris. He completed his studies at the Ecole des Beaux-Arts de Paris in 1988. In 1984 he completed the art Baccalaureate and in 1985 studied under Rudolf Lang (a pupil of Gustav Klimt). He started exhibiting at the Grand Palais while studying in Paris. There he was selected by Magritte’s wife, Mirabelle d’Or, for the Salon de Figuration Critique. From this the doors to the Drouot Auction House opened to him and Heimler sold his first paintings. Heimler spent the next 20 years living and working as an artist in Berlin. His renown increased in 1989 with his creation of a mural on the remains of the demolished Berlin Wall. His mural called ‘The Wall Jumper’, part of the East Side Gallery, is the second most visited historical monument in Berlin, with 3 million visitors per year. In 2012 'The Wall Jumper' was used as a backdrop in a film by Brian de Palma, entitled 'The Passion'. Heimlers' works have been sold through Sotheby’s in New York and by galleries in Berlin, Paris, Frankfurt and Brussels among others. Over the length of his career he has sold over 2000 paintings. The German art critic, Manfred Geisler, commented: 'Everything Heimler paints is real and unreal even surreal, at the same time show with much love for the people and objects he depicts. Heimler is one of the few painters who unquestionably have their own and unique style, known as the Heimler world... his world appears to be a real one'. Anna Proc who has a background in translation and public relation, began working with Gabriel conceptually for the Art Express travelling exhibition, which has been shown in Berlin, Budapest and Essen. In 2010 Gabriel and Anna moved to New Zealand. Since then they have established a firm foothold in the Wellington art scene. They extended their work to include a distinctly New Zealand narrative within an international context. They produced several murals in Wellington. Their mural 'The Mover', painted on the Museum Art Hotel opposite Te Papa in 2010, was voted the second best Wellington outdoor public artwork in 2011. 'The Mover' and 'The Wall Jumper' are landmarks in the newest edition of Lonely Planet travel guide books 'Discover New Zealand' and 'Pocket Berlin'. 2008 Heimler&Proc, ART EXPRESS, S-Bahnhof Jannowitzbrücke, Berlin - Concept and curator of the international travel exhibition ART EXPRESS. His concept was based on the Leibnitz philosophical concept about ‘monade‘ and observation of world art migration. Gabriel Heimler’s Work can be seen in private and public collections in France, Belgium, Germany, Great Britain, Italy and the USA. 2005-2007 Vorstandsmitglied des Vereins Berliner Künstler e.V.